Let’s face it – It’s only February, and we still have at least a month of cold weather left before we can put away the sweater, scarves and jackets. Bundling up is one way of beating the cold weather, but the contributors here at Midtown lunch like to reach for a hot bowl of soup to warm up. We’ve asked each of the contributors to share a favorite bowl of soup in Midtown, so read on to find out where we like to get our soup on. Blondie is a fan of the Vegetable Menchanko at Menchanko Tei. Over the past two years, I’ve finally fallen in line with the Ramen Lovers. As much as I wanted to get to Hide-Chan during lunch, it was brick out there, so I’d venture down the street to Menchanko Tei (45th btw 3rd+Lex). 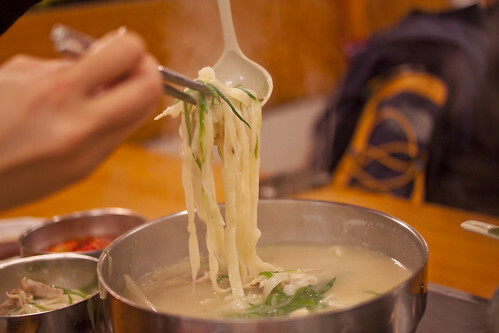 I get lazy in the cold plus they have Vegetarian Menchanko ($9.50), the soup I gravitate towards way too often. The salty miso broth, tofu, and vegetables warm my bones, and always give me enough sustenance to get me through the afternoon. I firmly believe it was the reason I was the only one in the office who didn’t get the flu. Donny T digs the spicy crab with sweet corn chowder at Soup Spot. Soup Spot (on 31st St btw. 7th and 8th Ave) cares about your health. I know this because every time you get soup it comes with a piece of fruit. They love us! On any given day they will have more than a dozen different soups ranging from chowders, vegetarian, chicken and rice, gumbo, apple and squash and many more other soups. There are so many reasons to love Soup Spot. Besides the piece of fruit, the menu changes daily, it’s cheap and it’s awesomely good. On my most recent trip, for $6, I got a small spicy crab with sweet corn chowder and half of a turkey sandwich. 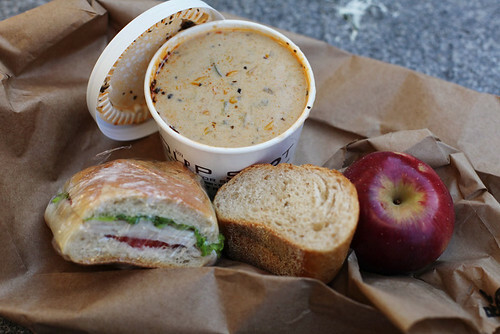 That of course came with a piece of bread and an apple. $6!! It’s $3.68 for a small and $4.90 for a large soup without the sandwich. The spicy crab chowder had just the right amount of kick to it, enough to let you know it’s there. Also they used real crab meat in the chowder. Of course I’m not the only person that likes this place, once the weather turns just a bit cold people will line up for their soups. The only down side to Soup Spot is that it’s tiny inside, therefore the rest of the people will have to wait outside in the cold dreaming about drinking that perfect cup of soup. Udon, curry and fried chicken – is there’s some other combination that better defines comfort food for me, I haven’t found it yet. And I need comforting. It’s just so cold. Udon West’s karaage curry udon ($8.50) has long been one of the few things I appreciate about winter. 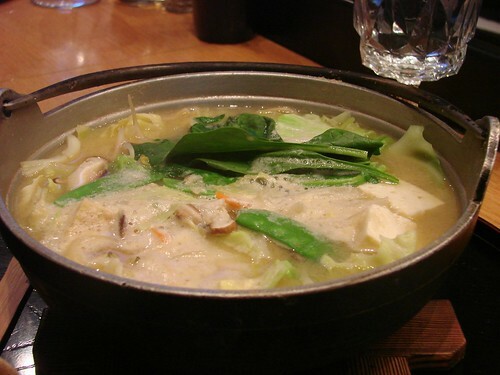 The broth is hearty without being heavy, the noodles are thick and chewy and the chicken chunks are meaty and well seasoned. Jeremiah enjoys the Maryland vegetable crab soup at Westerly Natural Market. produce, sits a row of steaming pots of soup. You ladle your own soup into a 16 oz. 16 oz. serving in their refrigerated section. My favorite is their Maryland vegetable crab soup. 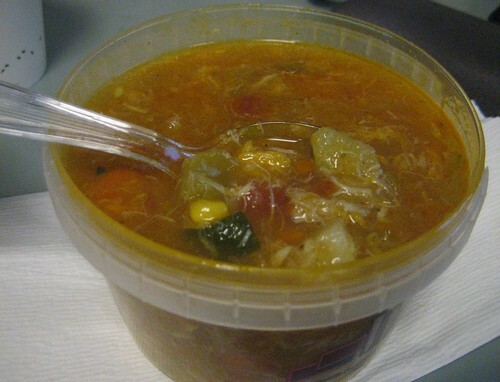 It’s basically a delicious, slightly spicy vegetable soup with cabbage, celery, corn, tomatoes, onions, potato, zucchini and a healthy does of Old Bay. As a bonus, it’s loaded with little bits of crab that lend that signature flavor to every spoonful. The lack of crabmeat chunks would be disappointing if the soup weren’t so delicious. Chris H adores the spicy vegetable chili at Cer té (on 55th btw. 5+6th). On cold days, i’m drawn to spicy soups like white on rice. 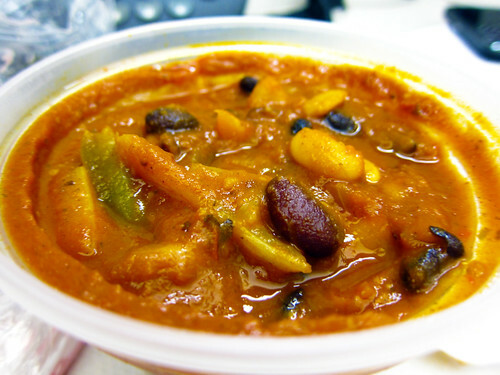 And if my go-to spicy soup, yuk gae jang at Cafe Duke, is unavailable, then Cer té’s spicy vegetable chili ($5.95) serves as a reliable backup. This chili is deceptively spicy, and chock full of chunky carrots, zucchini, and al dente pinto and black beans. Despite the fact that I’ve documented decadent lunches here on ML, I’m actually kind of a health freak, and even once dabbled in vegetarianism (I’ve since come to the light). Even as a full-time omnivore, Cer té’s spicy veggie chili is so satisfying, I don’t really miss eating meat. Whether you’re a vegetarian, flexitarian, or meatatarian, it’s hard not to like Certe’s spicy vegetarian chili. 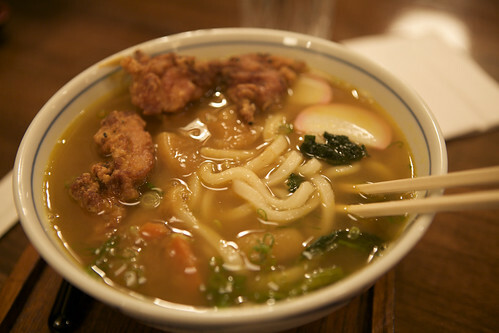 Posted by The ML Team at 10:30 am, February 22nd, 2011 under Certe, Contributor Stalking, Menchanko Tei, Soups, Udon West, Yushi. Terrific article. My favorites are Hide Chan, Oyster Bar (New England chowder), and Hale And Hearty (yes it’s too expensive, but the soup is really, really good). 20 Years ago you could have gotten phenomenal matzo ball soup in midtown at any one of a dozen places. I miss those days. Thanks for the reccos everyone. I love soup. I can’t believe that the Chicken Paiten from Toto Ramen is missing from this list. Also, Pearls Chinese Food on 7th beween 48th and 49th has some of the best egg drop soup I have ever had. Sadly, not much else there is any good. I tried going to Totto for the first time on Presidents Day. They said the wait would be 45-60 minutes (at around 1:15pm). Is it always that busy? No love for “alkie”? Or “wino”? Mama is a booze bag. Fresh & Co. (47th between 6th and 7th) has a great soup selection. However, it is grossly expensive. Daily Soup on 43rd (betw Lex and 3rd) has very good soups and good bread. For noodle soup, Oriental Noodle Soup on 45th is the only place I know that has real “hor fun”, or large flat white noodle. Oh, and the pho at Obao is good too. Not authentic pho, but ingredients are quality and fresh. Secret shame – I think the yellow split pea soup at Europa Cafe (cue collective “ewww”) is pretty good. But eat it when it’s still hot because it gets really thick as it cools. It’s okay. My old office used to be right above a Europa Cafe. I get their soup all the time. Arirang. I guess it was good enough to be the featured picture, but not good enough to be anyone’s favorite. 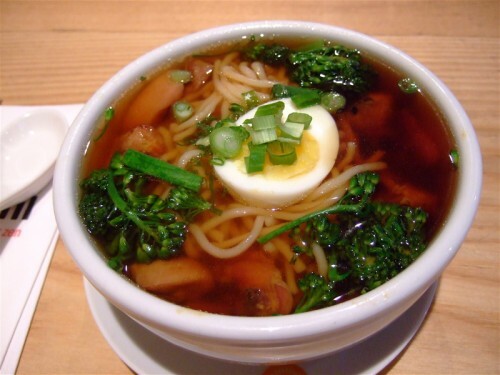 All in favor of ramen at Menchanko Tei. Hakata FTW!